This is a bright field image of the cross section of an elder plant. 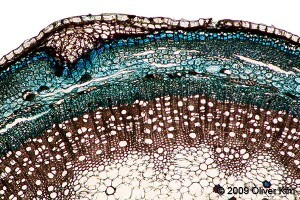 The inner part of the stem has a styrofoam-like consistency and is commonly used for making microtome cuts when preparing microscopic specimens. The elder (or elderberry) belongs to the genus of Sambucus. There are between 5 and 30 species in this genus.